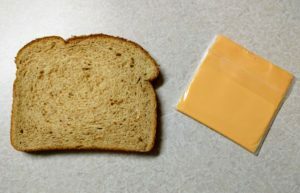 Step 1: Get a slice of bread and unwrap a slice of American Cheese (USA! USA! USA!). 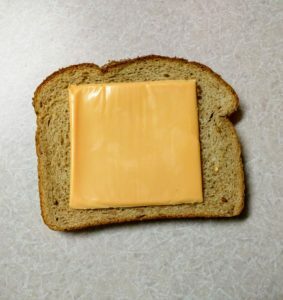 Step 2: Place unwrapped cheese in the center of the bread because it looks better in the middle. 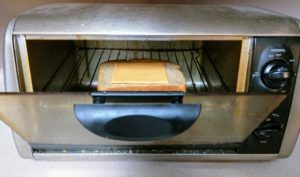 Step 3: Insert cheese topped bread into a toaster oven or a regular oven and set to Broil. Watch (if you can) as the cheese puffs into a toasty, cheesy pillow. 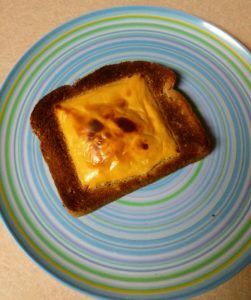 Step 4: When the cheese pillow is toasted to the desired brownness (or blackness), remove it from the oven. 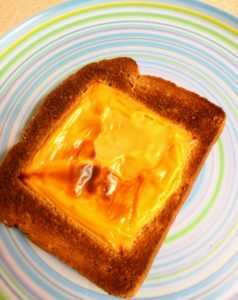 Step 5: Peel off the toasted cheese layer and enjoy a true delicacy! This is truly the best part! 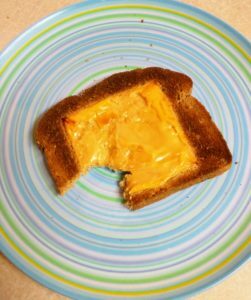 If someone out there can explain why toasty cheese tastes so good, I’d love to know. 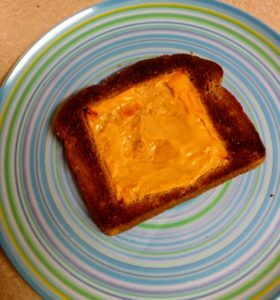 Step 6: Upon finishing the bliss of ingesting the toasted cheese layer and after you have returned to earth from this out of body culinary experience, you are left with the gooey under-cheese. 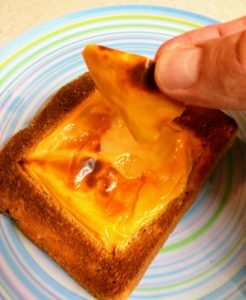 The combination of gooey with crispy toast is perfect way to finish your CheeseDream experience. Step 7: Eat it all up! Step 8: Make more CheeseDreams and share them with your family and friends!